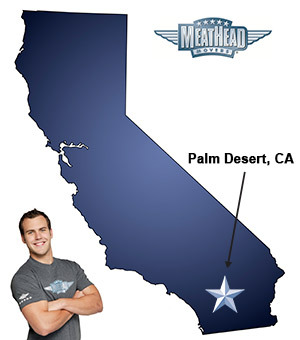 Whatever your moving needs may be, Meathead Movers will help you feel at home in Palm Desert. Our professionally trained student-athlete movers and our moving concierge will be with you for the entirety of your move to Palm Desert. Welcome to Meathead Movers of Palm Desert! An oasis in the Coachella Valley, Palm Desert is a thriving community that offers natural beauty and the recreational amenities of a resort destination. This city is home to first class education, amazing real estate, good job opportunities, beautiful parks, great shopping, and excellent public safety. Not only is Palm Desert in the geographic center of the Coachella Valley, it is also the shopping, dining, and cultural center of the greater Palm Springs area. With an abundance of hidden places to explore, you’ll never run out of things to do in Palm Desert. If you are considering moving to or from anywhere in Palm Desert, we are the moving company for you! Our professionally trained student-athlete movers and our move concierge are here to help you with every stage of your move in Palm Desert. Our moving company specializes in local, long-distance, and commercial moves to, from, and within Palm Desert. We also provide reliable packing, storage, on-site relocations, and our distinctive moving concierge service, which connects you with local service providers. All our student-athlete movers are thoroughly screened and trained before their first move. With branches not just in Palm Desert, but all throughout California, we are your one stop resource for all your moving needs, no matter where your California move takes you. We have been revolutionizing the moving industry since 1997. When you entrust your move to Meathead, you can rest assured that your move will be a success because our professionally trained student-athlete movers are the best movers the industry has to offer. In fact, you can see what your neighbors in Palm Desert have to say about us. With our 100% satisfaction guarantee, the only thing you have to lose is the stress that comes from moving! Contact us today for a free no-obligation moving quote and to learn how we can help you on your next move! Moving to Palm Desert? Here are some helpful resources. View more Palm Desert resources. 2students were friendly, accommodating, and fast. The company went out of their way to do a 1 1/2 day move so my elderly father could sleep in his own bed! Thanks so much! Hunter and all the movers. Everything that you said you were going to do you did. No Surprises including the price. In fact after our final box count, the price was reduced from the original quote. You are a first class operation! We had a problem that stemmed from the original estimate however working with the estimator were able to resolve the issue. Meathead Movers was exactly what I needed during my first big move! The guys that helped move me were extremely professional and willing to help wherever needed. It was nice having such friendly faces around during a time of high stress. The admin side of things was also very easy. They walked me through the process every step of the way. I never could have kept my cool as well as I did had I not had such great help. Much appreciated! !